When a band tours with a stage show that routinely features confetti cannons, dozens of people dressed as furry animals, a man-sized plastic bubble and other giant props, it should come as no surprise that some of its audio equipment is a little out of the ordinary. 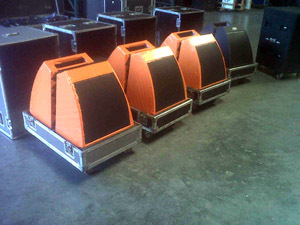 For the bands latest tour, psychedelic rock band the Flaming Lips requested a monitor speaker system that included ten EAW MicroWedge Series MW15 Stage Monitors and two MicroSub Stage Monitors custom-finished in bright orange, allowing them to fit in perfectly with the onstage mayhem. Of course, the Flaming Lips, who formed in Oklahoma in 1983, were looking for more than just cosmetics. EAWs compact, low-profile MicroWedges have become a popular choice among top touring artists for a variety of reasons, including clear and consistent sound quality, high power handling, exceptional gain before feedback, portability and durability. The MicroWedge was co-developed by EAW and Dave Rat, owner of Rat Sound. According to the bands monitor engineer, Sam Cole, "I couldn't be happier about mixing on the MicroWedges; they're loud, punchy and crisp and don't require a ton of EQ to get that way. Plus, they don't break my back when I try and carry two of them across a festival stage." The GRAMMY-winning band played festival shows in the U.S. and Europe throughout the summer, including Bonnaroo in Tennessee and Bestival in Spain, and in November will perform in Singapore, Hong Kong, Japan and South Korea. The latest releases from the Flaming Lips include Embryonic, released in October 2009, and a full-album reinterpretation of Pink Floyds Dark Side of the Moon, released in December 2009. For more information, please visit www.eaw.com. Founded in 1978 and celebrating over 30 years of excellence, Eastern Acoustic Works (EAW) is a global leader in producing high-performance professional audio equipment trusted by the most discerning professionals for every possible sound reinforcement application. As the corporate parent for world-recognized brands Alvarez, Ampeg, Blackheart, Crate, EAW, Mackie and Martin Audio, LOUD engineers, markets and distributes a wide range of professional audio and musical instrument products worldwide. Our product lines include sound reinforcement systems, analog and digital mixers, guitar and bass amplifiers, and acoustic and electric guitars. These products can be found in professional and project recording studios, video and broadcast suites, post-production facilities, sound reinforcement applications including houses of worship, stadiums, nightclubs, retail locations, and on major musical concert tours. The Company distributes its products primarily through retail dealers, mail order outlets and installed sound contractors. The Company has its primary operations in the United States with operations in the United Kingdom, Canada and China. For more information, please see our website: www.loudtechinc.com.